At Izzzleep Capsule Hotel, located in Terminal One at Mexico City’s Juarez Airport, you can sleep in a capsule, or pod. It’s private, clean, secure… and cheap. Once upon a time (let’s call it 1979), in a land far away (let’s call it Japan), the Starship Enterprise and an old Pullman train car met, fell in love and reproduced. They called their offspring a Pod Hotel. And you should probably sleep in one at least once in your life. Pod Hotel? Those of you old enough, like me, to remember the original 1956 movie “The Invasion of the Body Snatchers,” with Kevin McCarthy and Dana Wynter, might have a negative reaction to the word “Pods…! !” So OK, let’s call them capsules. Better? Good. 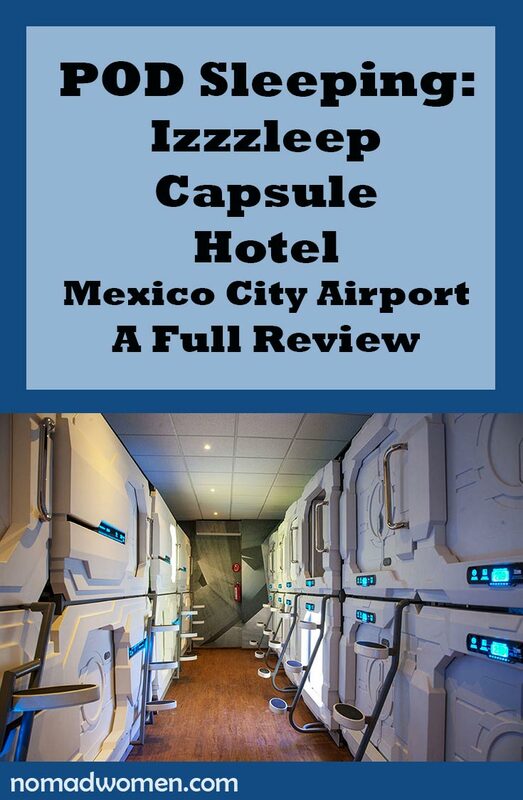 Then the next time you have a flight to/from Mexico City, or a longish layover that makes you yearn for a nap and a shower, you might want to consider Izzzleep Capsule Hotel. Located in Terminal One, the international terminal, Izzzleep “Intelligent Hospitality” can be a great option for a few hours or overnight at a very reasonable price. The capsule area at Izzzleep. This photo, by Izzzleep Hotel, shows the two levels of sleeping berths and the steps to the upper ones. It was obviously taken with the lights on. But the capsule area is actually kept quite dark, with only low-level blue lighting. Suggestion: Take a flashlight in with you. Of course there are pros and cons to sleeping in a capsule. Let’s get the cons out of the way up front. • The individual capsules are small, so this is probably not a great option if you are very large or severely claustrophobic. We’re not talking MRI tube small. There’s plenty of room to move around, sit up in bed. My capsule at Izzzleep measured approximately 7’ x 4’ (2+x1.25 meters). • The capsules accommodate only one person. If you’re traveling as a couple, you’ll have to book two, which wipes out a lot of the savings if you’re staying overnight. They can still be a great option for a nap and a shower though. • The locker and sink area is communal. You won’t be changing clothes there, or showering, but you will be washing, brushing your teeth, doing make-up, taking off your shoes, etc. in a co-ed locker room area. In this way, it feels a lot like staying in a hostel. • It can be more than a little difficult to dress and undress inside the pod, especially for older women who may be, shall we say, not quite as agile as we used to be. Since you can’t stand up, taking your pants off is especially tricky. And you will need to put them back on again to go out to the bathroom. • You won’t have your luggage in the pod with you. I did have my daypack in there, with my computer, hairbrush, etc. It sat on the foot of the bed by my feet. I also could have hung it on a hook. That list may sound daunting, but don’t let it put you off until you read more. The pros of staying at Izzzleep might convince you to try it. • The price – I spent a pretty comfortable night in my capsule, watched a telenovela on the overhead TV, had a good hot shower, and caught my morning flight a short walk away, rested and ready—and without the stress of getting to the airport on time—for just US$40, almost exactly one-third of what the night would have cost me right next door in the Courtyard by Marriott hotel. • Location – Izzsleep is located in Terminal One, the international terminal, which is the one readers are most likely to be using. Also, it’s located on the outside of the security check line, so it’s usable even if your flight leaves from Terminal Two. Just hop on the airport shuttle to get there. If, like me, you arrive at the airport on a long-distance bus from another part of Mexico, it’s dead convenient, only a few steps from where you get off the bus, to the left past the bus ticket counters. If you enter Terminal One from the front of the airport, it’s also not hard to find. Just look for the food court, walk all the way through it, and you will find Izzzleep on the left. • That food court is also convenient for when hunger strikes, with more than two dozen fast-food places with the usual burgers, sandwiches, pizza, plus Chinese and Japanese food, coffee-and-pastry outlets, and of course tacos and other Mexican specialties. There are also at least five full-service sit-down restaurants. • There is free WiFi throughout Izzzleep. • The capsule area is a strict quiet zone, meaning your sleep is unlikely to be interrupted by noise. Even shoes are not allowed in that zone. If you want to watch TV or listen to music, you will definitely need to use headphones. If you want to talk on your phone, you should go out into the communal area out of consideration for your fellow guests, who are only a molded plastic/fiberglass panel away. At check-in at Izzzleep, you’ll be given a cozy pair of thick socks. In the locker area, you take your shoes off and change into these socks, which you can take with you as a nice souvenir. I wore mine the next day on the plane. 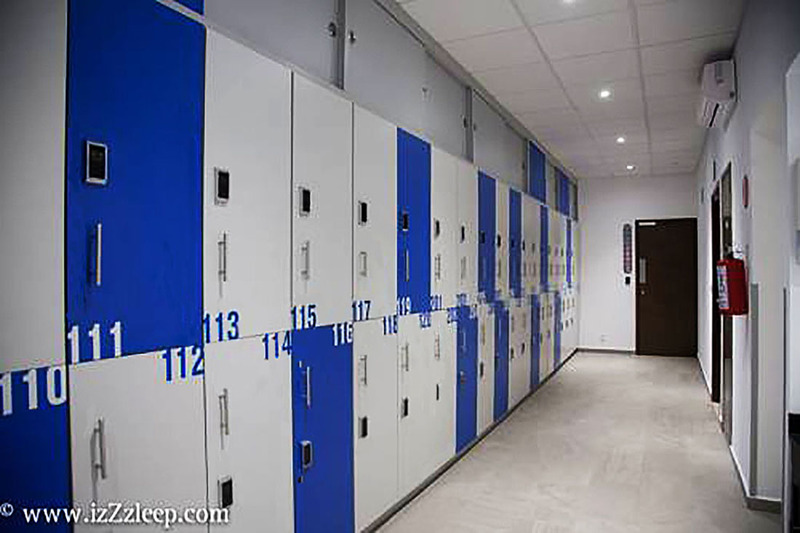 Each sleeping capsule at Izzzleep has its own locker, which is opened with your key card. Inside you’ll find a blanket, a small bottle of water, a hanger, and room for a suitcase and your shoes. The locker you open with your key card is not huge. It easily accommodated my carry-on and looked like it would also work for a larger, checked suitcase, but possibly not both. However, there is a luggage storage area in Terminal One. It’s located on the ground floor, along the inside wall, next to the Hertz Rental Car counter. (Check with the hotel before check-in in case this location changes.) Bag storage costs less than a dollar a day. In this capsule hotel, the pod area is quite dark, lit only by eerie blue lights that allow you barely to see the number of you berth. I suggest you have your cell phone handy with a flashlight app at the ready. 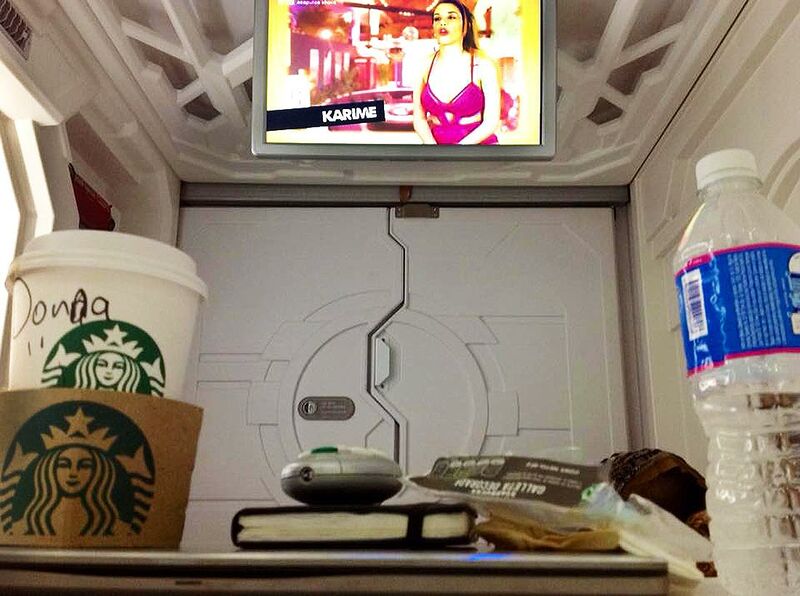 The sleeping pods, like Pullman berths, are arranged in two levels. To enter a lower berth, you need to get onto the floor and crawl in. For the upper berths, there are a few steps you climb up into your pod. 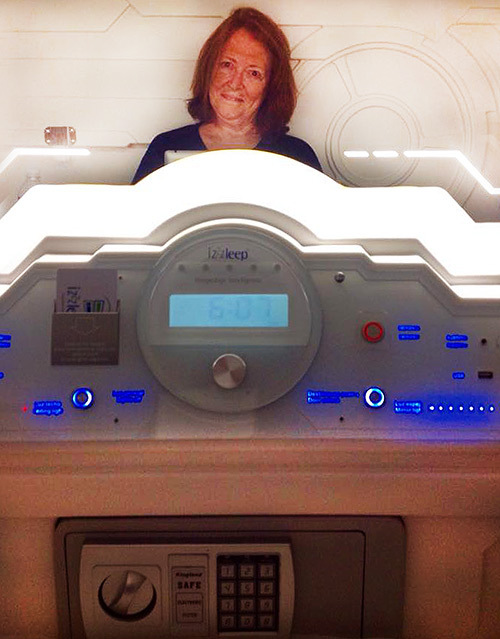 Cozy in my Izzzleep capsule, showing the control panel, safe, and large mirror. Once you’re inside your individual capsule, you’ll still want that flashlight to locate your control panel, below the large mirror. You can’t turn the lights on until you “energize the capsule” by inserting your key card into a slot on that panel. Slide in your card, then touch the button on the right side for the mirror light. This will light up the whole pod with white light. If you touch the button for the ceiling light, you will instead get a low, very blue fluorescent light, which might work well for those who like to sleep with a light on. The control panel also has one three-prong electrical outlet, two USB outlets, and two headphone jacks, an emergency call button, a small combination safe, and a button to lock and unlock the door to your pod. There is a ventilation control knob and a clock. Finally, there is a large button that turns off all the lights in your capsule at once. 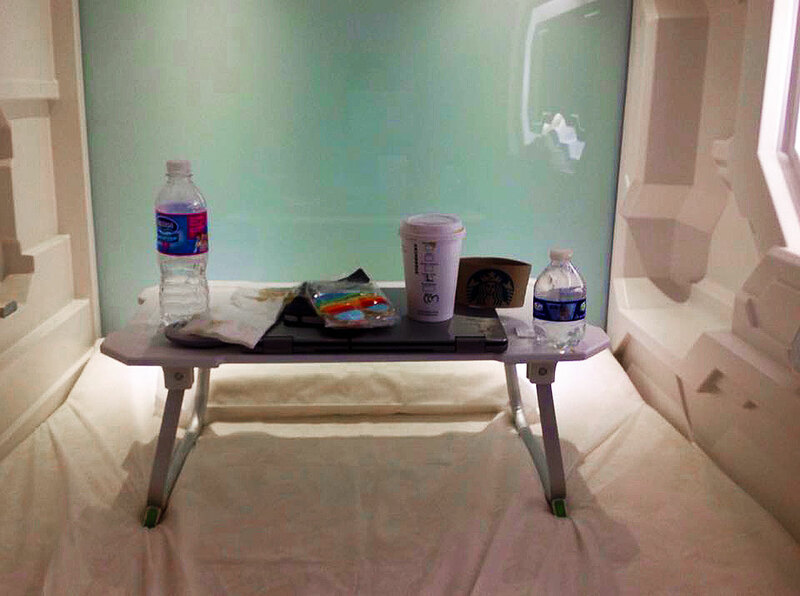 What Else is Inside the Capsule of Your Pod Hotel? On the wall of the capsule are two hooks for hanging items, plus a small fire extinguisher. As you sit up in bed, there are also two reading lights directly over your head with a touch panel to operate them. The TV is situated overhead. You pull it down and operate it with the remote given to you at check-in. There’s a foldable table/desk/tray hanging on one wall. I found it pretty easy to work on the clever contraption. You take it down from the wall, flip down the legs, and set it on the bed. It looks for all the world like one of those things people use to bring you breakfast-in-bed…should you be so lucky as to have one of those folks in your life (I unfortunately do not.) I imagined Jean Harlowe on satin sheets, a crepe de chine negligee falling just so from her shoulders, struggling to sit up against her fourteen satin pillows while a servant set her breakfast tray in front of her and threw open the curtains to let in the late morning sun. My situation was a bit less glamourous, but it got the job done. I was able to sit up on my bed, arrange my laptop and a notebook and type these notes. Where and How Do I use the Bathroom in a Capsule Hotel? There are individual toilet and shower rooms right outside the capsule area. They were both clean and the water was hot. 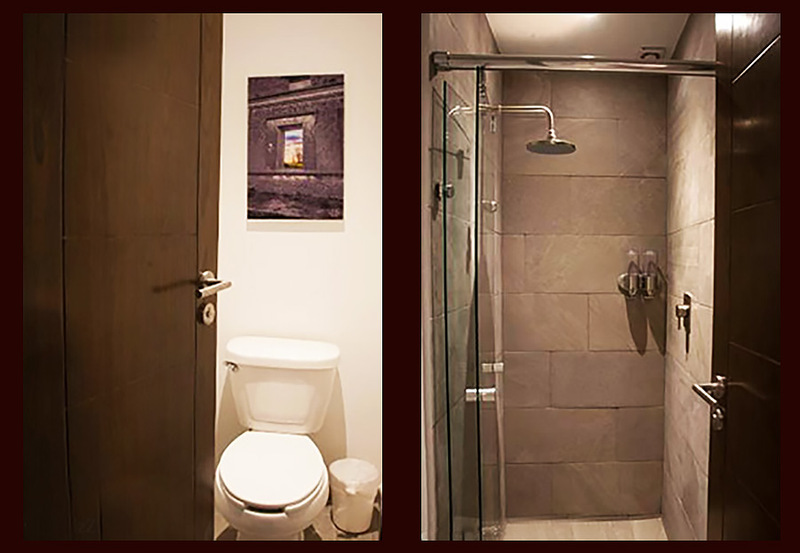 The toilet rooms and individual shower rooms are located right outside the darkened capsule area of the Izzzleep pod hotel. I thought they were fine. Everything was sparkling clean and there was plenty of hot water. 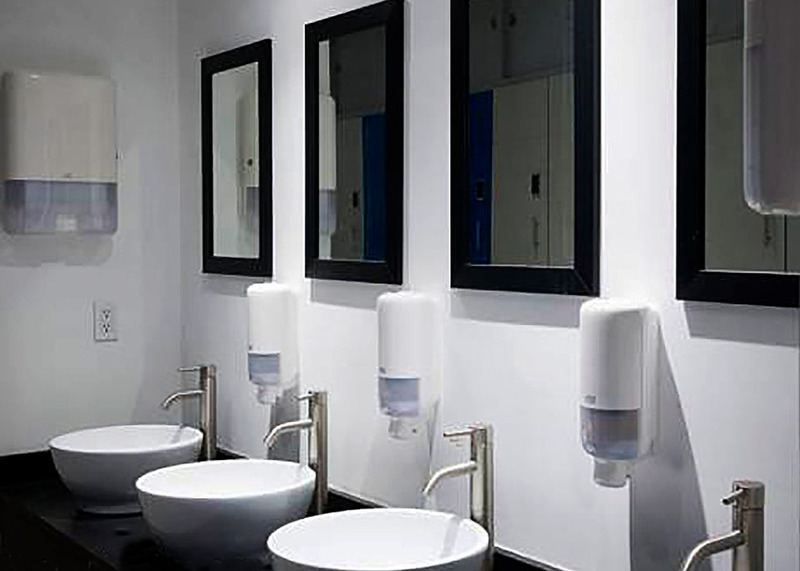 The sinks and mirrors are communal, located in the locker area. They were also very clean. 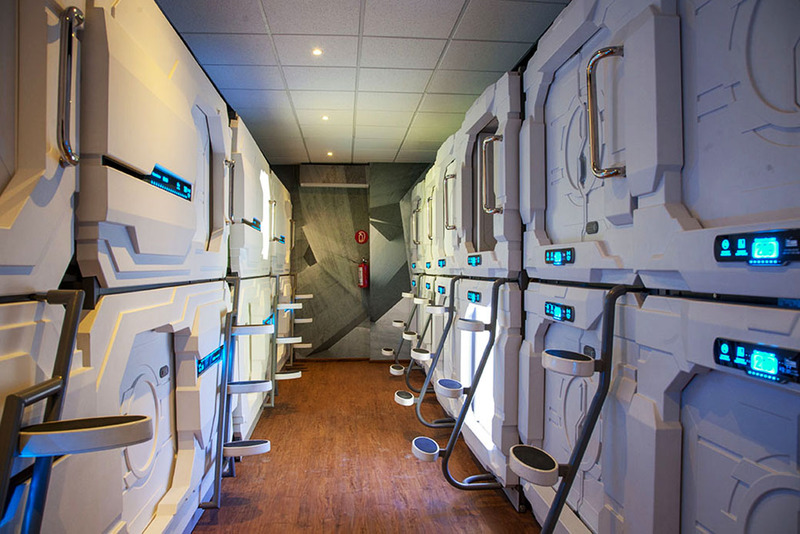 So, what’s the bottom line on this spaceship/pullman/hostel hybrid called a pod hotel or a capsule hotel? Based on my single experience with Izzzleep, I’ll be back. I am small (just 5’ tall) and have never suffered from claustrophobia, so I had no issues at all with the size of the pod. It’s an inexpensive and convenient overnight option if you arrive in Mexico City very late or have an early flight out. I would also certainly use it if I had a long layover and was exhausted. The thought of a nap on a bed and a hot shower sure beats trying to get comfortable in a chair at the gate. And for the money, it’s a no brainer. I can have some genuine fun with the money I can save staying at Izzzleep instead of the Marriott next door. 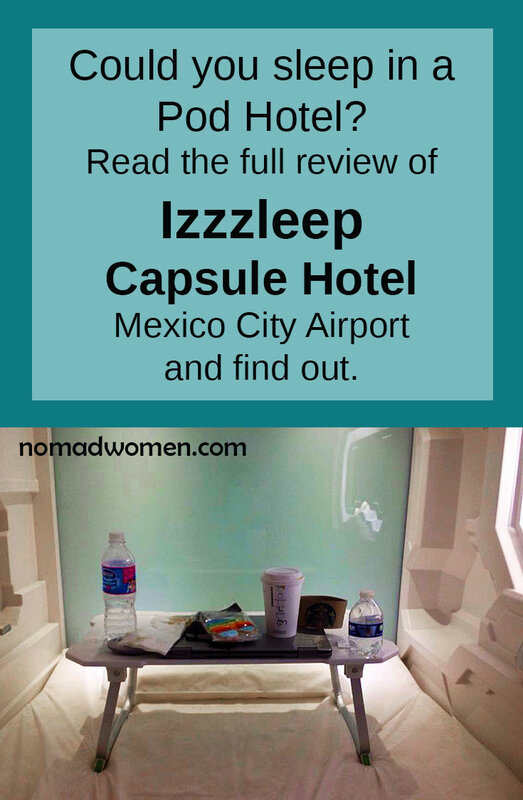 Izzzleep Capsule Hotel at Terminal One, Juarez Airport, Mexico City: My final opinion. Give it a try. You might like it! The front desk at Izzzleep is open 24 hours a day and I am assured that there is always someone there who speaks English. Reservations can be made at the Izzzsleep website (in Spanish only). The telephone number is (55) 2599 1434. If calling from the US, dial 011-52 before that number. Booking price is current as of July, 2018.